When machining deep vertical walls, it is sometimes needed to restrict tool contact with the already machined part. For this purpose, in the operations that perform machining by layers, it is possible to assign a draft angle. 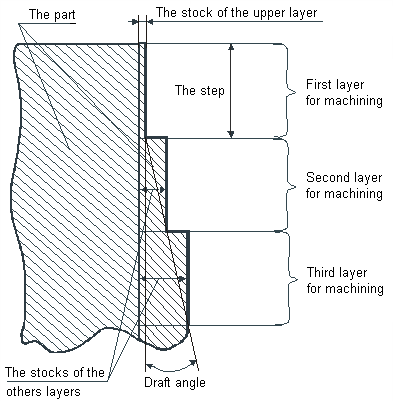 When machining a vertical (or close to vertical) surface, the real stock will increase at machining layer as shown in the picture (below). The draft angle is allowed for all walls that are close to vertical, i.e. not only close for the model being machined, but also the restricting ones. The draft angle value cannot be negative, nor can it be more than or equal to 90 degrees. Setting the draft angle too high will lead to a large layer of unmachined material at the lower layers. The draft angle can be assigned on the <Parameters> page.